Isthison - Who's Soiree Now? Isthison - Who You Starin' At? 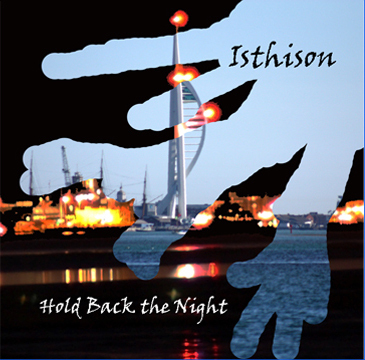 Isthison - For Those Who Are About To Rock! Isthison - Ba Di Ya Say Do You Remember? Isthison - Steady the Buffs! The 60s Cocktail Soiree was great. Starting with a big old space to set up in on the stage, the sky and clouds on the hall ceiling, and the model elephant hidden around the back. Trumpet, trumpet! It made up for all the stairs. I had to play my tie dye guitar because the stage lighting dimmer switch caused buzzing on my new guitar. Fitted the theme I guess - the tie dye, not the buzzing.. Yet again, some decent footwork on display from the dance floor. We enjoyed playing this gig, pulling out some old songs we hadn't played in a while, and learning some new ones as well. Happy days. The next gig is at the Sirloin of Beef, Highland Road, Portsmouth, PO4 9NH, on Sunday 12th May, from 1.30p.m. Always good beer here, and we'll supply the musical accompaniment to your refreshments. Support your local pubs! We had a terrific evening at The Golden Lion. A very busy gig, with an admirable team of energetic dancers who kept going for the whole evening. I can only applaud their battery power, and hope to syphon some of it for my own use. Many thanks to Adrian and Marina for booking us. The next gig is a 1960s Cocktail Night, at The Groundlings Theatre, on Friday 22nd March. The theatre is at 42, Kent Street, Portsea, PO1 3BS. Gig starts at 8.00p.m. The theatre is a lovely old 18th century buiding, and the gig is a fundraiser to help with restoration. Tickets from the Groundlings Theatre, hope to see some of you there. Support your local theatres! A good gig at the Sirloin of Beef last Sunday. A busy afternoon as well, which is always nice, with lots of positive comments, some about music, some about bottoms. We didn't win anything in the meat raffle, which is just as well, as Paul doesn't have the facilities, and Karen only eats plant life. The next gig is on Saturday 9th March, at the Golden Lion, 54 Bedhampton Road, Bedhampton, PO9 3EY. Gig starts at 8.30p.m. Hope to see some of you there. Support your local pubs. First gig of 2019 at the Fountain Inn Rowlands Castle. Nice pub, nice people, nice beer. Gig went well, and the rain was relentless. Three lads thought I was a taxi on the way out, maybe not noticing the car was full of gear? All good fun. I like playing at the Fountain. Next gig is on Sunday 17th February, at the Sirloin of Beef, Highland Road, Eastney, Portsmouth, starting at 1.30p.m. Hope to see some of you there. Support your local pubs. Well, it all kicks off again this weekend, so let's hope for decent weather and a busy evening. The Fountain is a lovely pub. Also hope I can remember the augmented 7th. The gig is on Saturday 9th February, at the Fountain Inn, The Green, Rowlands Castle, PO9 6AB. Hope to see some of you there. Support your local pubs. Well, it's that time of year once more. So, a happy Christmas to anyone reading this, followed by a contented 2019. This time next year, we'll all be millionaires. Or maybe not. Hope to see you at a gig next year. Do wop bamaloo bam, doo wop bam boom! Dave's party was a busy and rather jolly affair at the golf club, and we set out all the kit we could drum up. Two sets from us, and one from Dave in between. Plus some lovely food and the occasional drink now and then. We played for Dave on his 65th birthday, then his 70th, and now his 75th birthday. Some traditions just need to be kept up. Next gig is a private party. 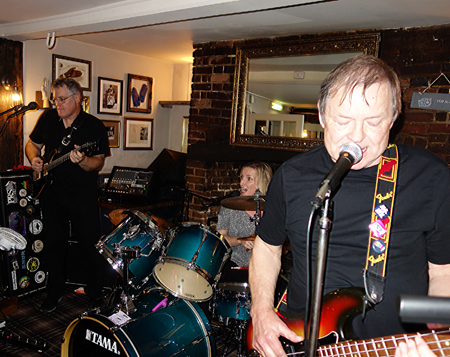 A very energetic gig at the Golden Lion in Bedhampton, on a lovely Sunday. I think I need a bigger amp to keep up with the rhythm section! I believe we are back at the pub in January. Next gig is a party for Dave, who I'm told is 27. Gig is on Friday 26th October. Support your local Dave. A hot, sweaty and rather manic gig at the Tap in North End. I think Karen and Helen are now engaged to some chap who was in the pub passing out rings. Most unusual, but congratulations anyway! Vivian Charles Gregson kindly videoed some stuff on the evening, and has posted that on the Pompey Pop facebook page. It is also linked via our facebook page. Thank you kind sir. Next gigs are at The Sirloin of Beef, Highland Road, Portsmouth, on Sunday 7th October, three sets from 1.30p.m. After that, The Golden Lion, 54 Bedhampton Road, Bedhampton, PO9 3EY, on Sunday 14th October. Two sets, (I think), from 3.00p.m. Support your local pubs! Sharon's 60th birthday party gig was great fun, much dancing and a fair few wine bottles emptied as well. We played a few new songs, and re-vamped a few old ones. Paul decided he needs a boom. Watch this space? Next gig is at The Tap, 17 London Road, North End, Portsmouth, PO2 0BQ, on Saturday 15th September, two sets from 8.30p.m. Support your local pubs! Terrific gig at The Golden Lion, really busy, really boppy. We played a long gig, and really enjoyed ourselves. It is a lovely pub. The smell of curry from the restaurant is a bit of torture at times! MUST get one some time! Next gig is a private party on Sunday, the one after that is Saturday 15th September at The Tap, 17 London Road, North End, Portsmouth, PO2 0BQ. Support your local pubs! A fab gig at the Fountain Inn in Rowlands Castle. Lots of dancing, lots of singing along and lots of friendly people. Triffic. I think we've been asked back, so that's good as well. To top it all, the landlady gave us all caramac bars! Haven't had one of those in years. Next gig is at The Golden Lion, 54, Bedhampton Road, Bedhampton, PO9 3EY, on Friday 24th August. Two sets from 9.00p.m. Come out for a drink or three, and maybe a dance to some foot tapping live music. Good pub, good beer, and an attached curry house. What more could you possibly ask? Support your local pubs! Cooler weather. Cool! We had a request to do a fill in gig for the Retrobeats, (thanks chaps), so hi ho, hi ho, back to work we go. Only 3 of us are available, so a smaller gathering. The gig is on Friday 17th August, at the Fountain Inn, in Rowlands Castle. Two sets, from 8.30p.m. The pub address is 34, The Green, Rowlands Castle, PO9 6AB. Support your local pubs, and your not so local pubs! Well, it's hot enough to gorill a banana on the pavement; thank goodness I'm not at work. We've been working on a few songs from the 1980s, a bit of a musical desert to me, but some fun to be had. In between that, a few days off for some attempt at holiday type stuff, assuming we're not melted into little puddles on the pavement. Next gig is at The Golden Lion, 54, Bedhampton Road, Bedhampton, PO9 3EY, on Friday 24th August. Two sets from 9.00p.m. Come out for a drink or three, and maybe a dance to some foot tapping live music. Good pub, good beer, and an attached curry house. What more could you ask? Support your local pubs! 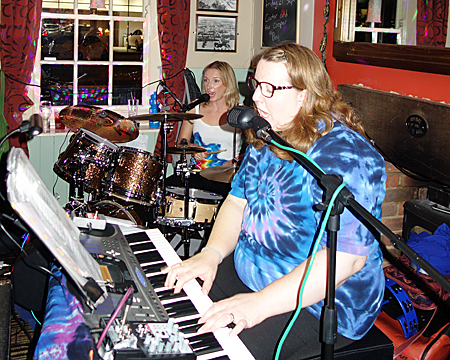 A hot and unsubstantiatedly humid gig at the Sirloin of Beef, and we aired a lot of songs we hadn't played for an age. Fun, but a bit 'seat of your pants' in places. I must have sweated a gallon at least, partly the heat, partly the fear of falling over the stands. Bit cramped, and must have a break from fiddling with electronics next time. Summer hols time now, so a few weeks off. Next gig is at The Golden Lion, 54, Bedhampton Road, Bedhampton, PO9 3EY, on Friday 24th August. Two sets from 9.00p.m, I think, but will confirm. Come out for a drink or two and maybe a dance to some foot tapping live music. Support your local pubs! Quiz team Cottage Pie night at the Old Oyster House. Terrific. Music, drinking, toothsome catering, plus Karen's new sparkly drum kit. Makes the rest of us feel a bit drab. We like playing at the Old Oyster House. Next gig is at The Sirloin of Beef, 152, Highland Road, Portsmouth, PO4 9NH, on Sunday 3rd June. Three sets from 1.30p.m, with a break for the meat raffle somewhere in set 2. Good range of real ales here, ideal for a lunchtime drink whilst listening to some foot tapping live music. Support your local pubs! Saturday Night Live at the Old Oyster House. Featuring Karen's lightweight moving drum hardware, and Paul's hypnotic light show. An enjoyable gig with some frantic dancers and guiness for the guitarist. Helen kept smiling and Terry got more deaf as his ear infection rambled on. Can there be a better way to spend a few hours? No is the word. Not grease; though we did play that one. Does everyone in the world know the moves to Greased Lightning? Certainly seems that way. Next gig is back at The Old Oyster House, Locksway Road, Portsmouth, PO9 3EY, on Saturday 12th May. Two sets from 9.00p.m. Support your local pubs! First gig at the Golden Lion in Bedhampton. 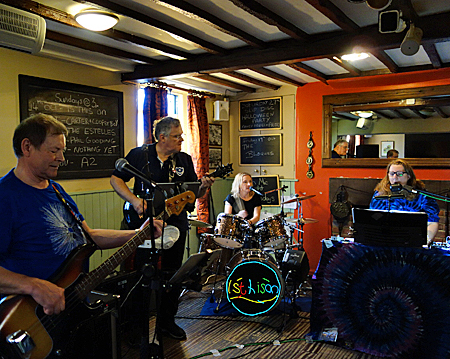 A lovely compact old pub, so we took minimal gear, and Karen used her Roland electronic drum kit to save space. Friendly landlord and customers made us very welcome, and we had a fun afternoon. Sadly didn't have a curry afterwards, but we're booked to play there again later in the year, so maybe next time. Next gig is at The Old Oyster House, Locksway Road, Portsmouth, PO9 3EY, on Saturday 14th April, from 9.00p.m. Support your local pubs! Hey Bulldog or Hey Bull Terrier? 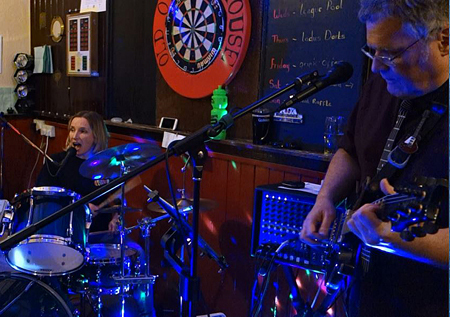 Our second gig at the Old Oyster House, and even more fun than the first one. Slight hiccup when the big charity dog's tail broke off; life can be hard! We had a new band banner, and a bunch of party lights in action, which illuminated the greased lightnin' dancers. Can't believe how many people know all the Grease dance moves; makes playing the medley so much fun. 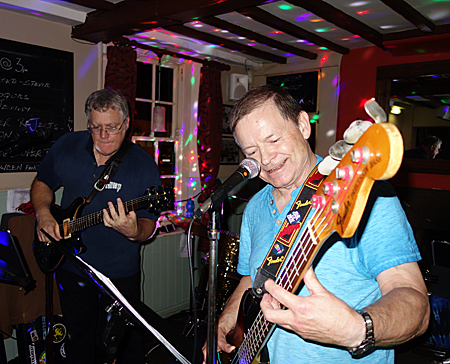 Next gig is at The Golden Lion in Bedhampton, PO9 3EY, on Sunday 25th March, from 3.00p.m. Support your local pubs! Our first gig at The Tap. A quiet start for Set 1, then whoosh, the pub suddenly filled up, and a manic Set 2 followed, with sing a longs and dancers. First outing for a Kim Wilde cover after only one rehearsal. Triffic! We look forward to playing there again in September. Next gig is at The Old Oyster House, Locksway Road, Portsmouth, PO4 8LH, on Saturday 3rd March, from 8.48p.m. Support your local pubs! Our first gig at the Royal Marines Association Club was a great success. Nice club, friendly people, lots of dancers and cheap beer. What's not to like? 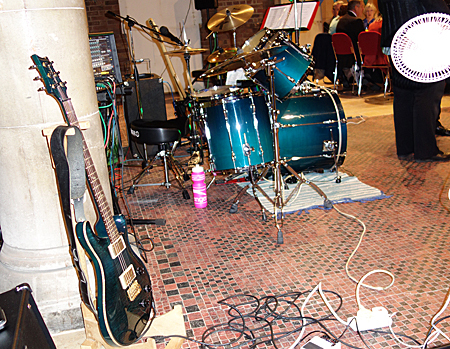 We had a bit of trouble with the noise limiter, as it's hard to rock and roll quietly, but all in all, a fun night. I raised a glass to my Dad's cousin Bernie, a marine bandsman in World War 2. We look forward to playing there again. Next gig is at The Tap in North End, Portsmouth, on Saturday 17th February, from 9p.m. Support your local pubs! Three sets for New Year's Eve at the Eastfield! A busy evening, from one year and into the next, with some lovely dark mild on tap as well. Yum. Thanks as always to Pete, and to Liz as well. Happy New Year to all who read this, hope to see you at some gigs in 2018. Support Live Music, and your local pubs and clubs. Next gig is at The Royal Marines Association Club in Dunn Close, Portsmouth. 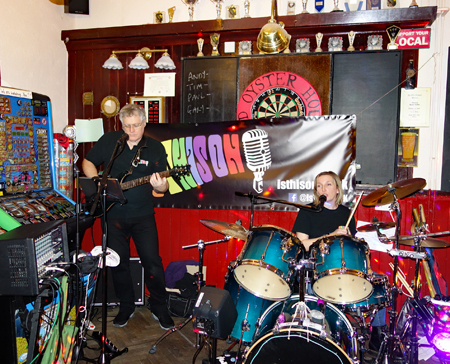 Our first gig at The Old Oyster House was great fun. A warm welcome from Cath and Paul as we set up, a lovely open fire, and friendly punters. We played two sets and some extras, with the Grease Medley especially well received. Hoping to sort another gig there in the New Year. Next gig is at The Eastfield Hotel, in Prince Albert Road, Portsmouth PO4 9HT, on New Year's Eve, Sunday 31st December. We are playing 3 sets, starting at about 8.45p.m. We'd love to see you there, with your dancing shoes. Support live music and local pubs! We returned to the Sirloin of Beef for another Sunday afternoon bash. On arrival, we discovered parking spaces close to the pub - a dream come true, and then a most welcome coffee from the landlord as we set up. Excellent stuff. Three sets of songs, including some stuff we haven't played for a while. A Status Quo tribute reminded us how much fun it is to play their songs. R.I.P Rick. Thanks to the staff and punters at the Sirloin, see you again next year! Next gig is at The Old Oyster House, in Locksway Road, Portsmouth PO4 8LH, on Saturday 9th December. We are playing 2 sets, starting at about 9p.m. We'd love to see you there, the more the merrier. Switch off the telly, and come on down. Support live music and local pubs! A stand in gig at the Old House At Home in Havant. We had to play as a three piece, as Helen was unavailable. 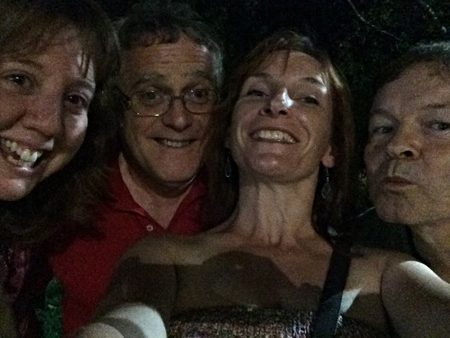 A fine old pub, with friendly clientele, out for a drink and a dance, which we were more than happy to support. A different dynamic with a three piece band, very rock! All went well; a busy and successful gig. Next gig is at the Sirloin of Beef, in Highland Road, Portsmouth. We are playing 3 sets, starting at 1.30p.m. Pop down for some well kept real ale, and some well played music! Back to musical work with a spooky gig at the Eastfield, with new lights, and some new outfits! Pete had surpassed himself with the decor, with hosts of spiders and skeletons dancing around. Another chance for us to play Monster Mash and Ghostbusters is always welcome. See us playing the 'Earth Wind and Fire' song - 'September' at the gig, on the video, (see), page. Next gig is at the Old House at Home in Havant, a three piece gig, as Helen is sadly unavailable. A happy gig at St Cuthberts, other than the miserable chap who pinched Karen's parking space. Some of the band stuffed their faces first with a three course dinner, courtesy of the kind organisers, then off we went. So much space to play in was unusual for us, but were able to communicate with semaphore. 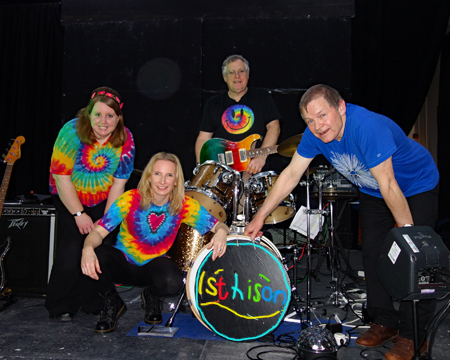 This was a tie-dye gig, so all was colourful, which showed up nicely on the vids that Sue filmed for us. We played a few songs we hadn't played for a while, and stuck in a Neil Diamond request. Tight playing, responsive audience, happy dancers. What more can one ask? Next gig is for Pete at the Eastfield Hotel, Prince Albert Road, Estney, PO4 9HT. We're playing from 8.45p.m. 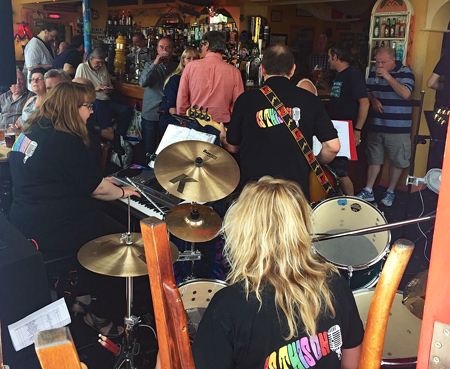 Open door gig at The Sirloin of Beef - literally; which was most welcome on a humid day. First time we've played there. Very friendly punters, with lots of singing along and very positive feedback. Nice to see Elizabeth dancing in the street. We tried out some new speakers, much lighter and easier on the ageing backs of certain guitarists. Thankfully, a successful try out. All that and a triffic selection of real ales as well, what's not to like? Next gig is for St Cuthbert of Lindisfarne. Meet you on the corner? First gig for a while, as we crushed into the Eastfield, playing in the fireplace. Hot stuff. Thanks for the drinks Pete! Next gig is at the Sirloin of Beef, in Highland Road, Eastney, PO4 9NH. We're playing from 1.30-4.30p.m; don't know if it's in the fireplace.. Be there, or be an equilateral rectangle. Down to the casemates rehearsal rooms twice in a fortnight. Session 1 - band rehearsal in the Live Room. Pump up the volume and get more toilet on the vocal mix. Much more toilet. Speaking of toilets, there was a sign in the Casemates toilets saying - don't flush your underwear down the toilet. Classic. Well, we've all done it. Session 2 - drum track recording for a few hours. Enough battering to supply a chip shop. Great fun, and nice work Karen. Flasks of tea all round; rock & roll. I'm gonna cut you into little pieces! First rehearsals complete, and it turns out we remember how to play! Set lists now agreed for the first couple of gigs, a two setter and a three setter. We're getting the flow back and tightening the ship. Four bells and all is well. Helen's family,(and hence workload), is now increased with the arrival of Laura. Congratulations from us all! Band thoughts now slip a little towards rehearsals, and sorting a gig or two. Can we remember how to play? Does all the gear still work? Have any of us been abducted by aliens? Only time will tell ; though as Chuck said - you never can tell. At this time of year we should all take some time to think of the true meaning of shopping. As we listen to the festive sound of the hammering of the credit cards, and watch the multitudes lining up at the 'returns' desks. Remember, it's the receipts that count! Grilled Frankenstein and More? So, from all of us in the band, to anyone reading this, we wish you a happy christmas, and a contented new year. The Halloween gig at the Eastfield was rather a good finale to our year, with Helen now on maternity leave. Some spooky costumes at the gig, and some even more spooky dancing! We added 'Monster Mash' to our Halloween song list, and that one is great fun to play. Paul had to park 5 miles away from the pub, and is expected back sometime after Christmas. Thanks as always to Pete for his hospitality. Now onto some recording, and we'll be working in our Lab, late some nights. Hopefully our eyes won't behold too many eerie sights. As Helen prepares for expanding her family, the band prepares for a bit of a hiatus. To fill the gap, the plan is to get back to doing some recording. The last lot was done in 2011, so a bit of time has elapsed. A reasonably smooth session deciding what songs to do, followed by the usual less smooth stuff. Demos of most songs are done, so we're near enough ready to make a start on 'proper' recording. Should be done by 2019. Next gig is at The Eastfield Hotel, PO4 9HT,for Halloween, on Saturday 29th October. We'll start about 8.45 or so. Summer Jam Fest, at Sopley Farm in the New Forest was triffic. On the trip there, Paul sweated as the lanes got narrower and the trees bounced off both sides of his car. Luckily our car was narrower, so we only had to worry about avoiding weasels. After a few generational issues, the power was sorted and we opened up with a bit of James Brown. It was a lovely sunny day, and the ladies from Strawberry Fields Foods kept us supplied with pies, cakes and tea, and then an outstanding high tea with all manner of goodies. Pedal to the metal for the last set, and then time to pack up and face the weasels again. Lovely day on the farm, can't beat a bit of British Summer Time. Coming up soon is Summer Jam Fest, at Sopley Farm in the New Forest, from about 11a.m. Organised by the lovely people at Strawberry Fields Foods. There's loads of stuff to do, and we'll be playing from about 1p.m. Helen can't make this one, so we'll be playing as a 3 piece. Maybe not Cream, but maybe Cream Tea. Love to see you there. The post code is BH23 7AZ, and the weather forecast is warm and sunny. Our gig for the Queen was fitted in around the England V Russia football match, at the Eastfield Hotel. A bit before the game, a bit at half time, and more after the match. Some energetic dancing on view in the pub, especially from Paul's brother, and some energetic violence on T.V from Russian 'fans'. Thanks for the burgers and beers Pete, see you again soon. Next gig is in the New Forest; Strawberry Fields Food Strawberry Jam, at Sopley Farm, on Saturday 16th July. 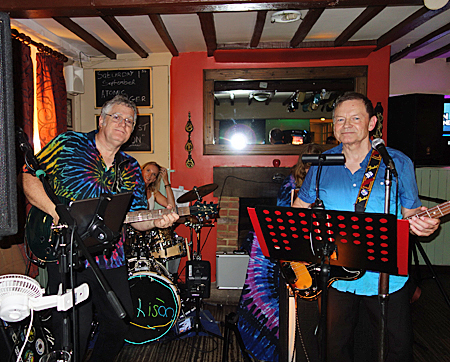 A fab '70s night and Dance' gig for Mary and Mark on Saturday. Dancing started on the first song, and carried on until the end of the gig! Two hours playing, plus an encore, and a tasty ploughman's lunch in between. Karen won a dog bowl in the raffle, which was labelled 'man'. She seemed pleased with it. Sue won a bottle of wine, and O.D'd on cheese, which was strange. We really enjoyed playing this one, and would like to thank all the folks that came out to enjoy themselves, and so made our job such fun. Karen is off to Cuba for a Caribbean holiday jaunt, so we are on a bit of a hiatus now. Be seeing you! Next gig up is a 70s and Disco night on Saturday 7th May. We are playing two 1 hour sets, starting at 7.45p.m. The gig is for Mary and Mark at St Mark's Church Hall in North End. Tickets £7, include a buffet meal, and are available from St Mark's Church. Collingwood is a lovely place to play. We had a big old stage to set up on, with loads of room. Not a common experience for us. We communicated by carrier pigeon. Nice lighting, decent sound and really cheap beer! We played one 75 minute set; the requested format being rock music - 'can you play some Led Zeppelin, Status Quo, Stones, The Who etc'. No problem! The gig went well, and very quickly. Having cleared our gear off the stage, we relaxed with a drink and watched the next band up The Jaspers. Nice guys, nice set, loved the guitar synth! Paul was inspired to dance. If you're really good, we'll post the video of him winning a dance competition in Cyprus one day....Also stayed for a bit of classic rock from The Unwritten Rule. We liked playing at Collingwood. Next gig up is ParadeFest in Portsmouth on April 16th. Two outdoor stages, with 'Shoot the Duke' (I like them),and 'The Revival' playing as well. Should be a good day if the weather stays dry. You can always trust the weather in April, (he said hopefully). Starting the year with some new songs, and a bit of recording. The first gigs are coming in, starting with a three band rock evening. Two, three, four -- !!!!! Gigs to play , and gigs to see. Hope to see some of you in 2016. Our second gig at the Eastfield. Thank you to the staff and punters at the Eastfield, for making our gig such a success. We played into 2016, with lots of dancers, jogging along to the thunderous beat. HAPPY NEW YEAR!! Thanks to everyone we played for in 2015. Hopefully, 2016 will be a healthy and prosperous year for us all. Another fun gig at the R.A.O.B Club. A different class altogether. We played a lot of old songs we haven't played for a while. Paul sang American Trilogy, accapella, for a bet, and got free drinks all round. We'd like to thank all the patrons of the club for making us so welcome. Different class indeed. Next gig is at The Eastfield Hotel in Prince Albert Road, on New Year's Eve. 3 sets from about 8.45p.m, and on into 2016. For any Sat Nav wielding time travellers, the post code is PO4 9HT. Might I suggest: A very welcome and welcoming gig at The Eastfield on Halloween night. Great to see Pete again, fooling and ghouling around - and what a marvellous effort put in regards spooky decorations! Thanks to everyone who turned up to celebrate the evening with us, especially the late-comers from The News, dressed up in all sorts of scary garb, including one very large cockroach... *ROACH! * - you know whoooooooo you are! Don't forget, we're back here again on New Year's Eve. Next gig is at the Buffaloes Club in New Road, (PO2 7RW for you followers of satnavicity), on Saturday 28th November. Three sets, from about 9p.m. O.K once more now Paul? 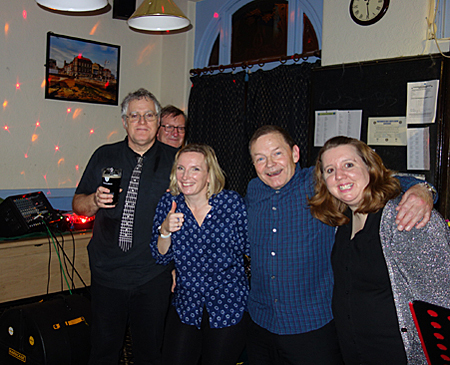 Another 3 setter at the Buffaloes Club, with Paul back on bass, (not seabass, that's an entirely different kettle of... well, you know).Some more crazy dancing, and lots of booze consumed, though not by us! Thank you to the club members for the warm reception. Next gig is at the Eastfield Hotel, (in Prince Albert Road, Portsmouth), on Halloween, Saturday 31st. We'll be playing from about 8.45p.m. Here is the postcode - PO4 9HT, for those of you wanting to use your sat nav to get there. O.K now Paul? 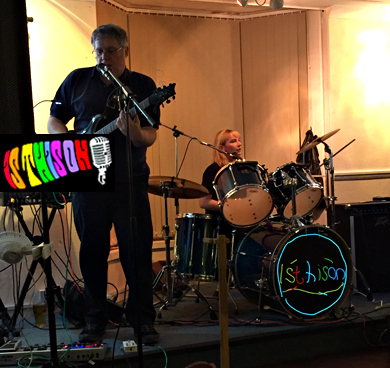 A fun filled evening at the Sapphire Sixties gig last Saturday. Dancing took place from song number one, and went through until the encore, with a break for the ploughman's lunch, (well supper I suppose), and the raffle. Strangely, the band won most of the prizes, and even I began to suspect it was fixed! Thanks again to Sarah and Ged for support on vocals, bass and cheese eating. It all went very well, and there are plans to repeat the event. Hurrah! Next gig is at the R.A.O.B Club, on Saturday 17th. We'll be playing 3 sets from about 9p.m. Nice to be back at The Artillery; thank you to Chloe and Steve for booking us. We always like playing there. We had to stop for the meat raffle, but we didn't win. Boo! Next gig is a 1960s party for Mary and Mark. All tunes will be from the late 1950s and the 1960s. Paul is away country and westerning,(ee ha!, so Ged and Sarah will be joining us to make us a five piece for the evening. Tickets are £7 and there is a ploughman's lunch included. Hope there's pickled onions aplenty. A fun evening at the Buffaloes Club. We played on into the night, as the dancing got intense. Lots of friendly people, and we were made most welcome. Home in the small hours, and Terry had to catch a train to London by 9a.m to get to the Radio 2 Hyde Park Event. Rock & Roll? Like Arnie said, we'll be back! A busy day, with two gigs on the cards, plus fighting through the traffic going to the Portsmouth Festival. A nice warm day with a few tunes, gave way to a hot sweaty evening of music and dancing on Whale Island. We played two sets and did some backing work, and it was a successful evening. Thanks to all who came, and £600+ was raised for Sophia. Sadly, we didn't win the box of Freddos in the raffle. Hair Extensions or Set List Extensions? Time to extend the repertoire yet further, with new songs; some recent, some older. Now over 130 songs and medleys are on the books. Recording a few demos as well to keep the song archive up to date. Look out for the Isthison jukebox. Rock out the old, rock in the new! Really enjoyed the new year gig. We played for 3 hours, and there were loads of enthusiastic dancers. Some new songs, some old songs, but all fun. Thanks to Pete and the patrons of the Artillery for such a good evening. Happy New Year to all of you. Live long and prosper. Halloween was funny. Helen's facepaint was scary, and Terry couldn't find his gig trousers. Not quite the mudshark legend, but there you go. The family dance routines were definitely sweet, and Sue's wine intake was quite remarkable, as David Coleman would have said. Celery say the old folks. The ceiling spider was huge, a real bowel loosener for arachnophobes. Busy working on new songs, and sorting set lists for Halloween. When will we four meet again at the gingerbread house? Anyone got a rotting pumpkin? England one, but Italy won. Sunday 15th June - We set up in the garden, under lowering skies, but despite Paul and Helen's electrical fears, the rain didn't come, the only liquid falling being bat urine, (or maybe it was dew). After a nervous start setting up Karen's new electric drum kit, we got it working through the P.A, and then played on into the night as the barbecue sizzled. Seeing the drum kit dance away was interesting, but a bag of rocks put an end to that. Quantities of beer helped some folk dance despite the bag of rocks, and sing along raucously as well. The guy on his stag night singing 'Stand By Me', accompanied by Terry on guitar was a nice finale to the evening; thanks for the beer! Wednesday 11th June - Gearing up for the opening game of England's World Cup campaign, with a barbecue and gig at the Artillery Arms on Saturday 14th, followed by a bar extension to see the game. Everyone is welcome, Lee's barbecues are legendary. We may be playing in the pub's garden, weather permitting, first chord at 7.30p.m. Friday 18th April - A dry sunny day for the Car Rally gig. Unheard of! We played two sets of sunny music, but didn't get a go on the waltzer, or the trampolines. Shame. The tea and burgers were good, (Mick's burgers are recommended). Thanks to the Lord Mayor & Lady Mayoress for their kind words. A bit of time out next. Tuesday 18th March - Packed house for Bryony's party bash, we've never seen the Artillery so busy. The evening zipped along with lots of communal singing, loads of party dancing, some interesting drinking games, plus lovely comments at the end. A fun gig all around, and Burt the Drummer was exhausted. Photos from the evening are now on the Pics page. Next gig is at Havant Plaza for the Classic Car Club. Beep beep, beep beep, Yeah! 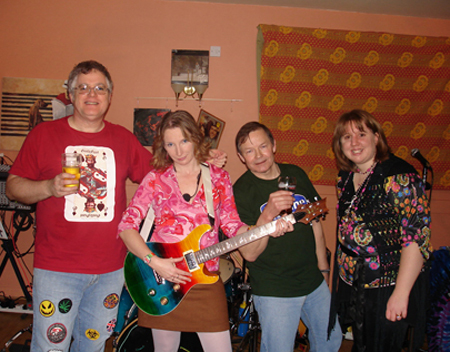 Wednesday 12th March - Last rehearsal at the Old Blacksmith's Studio in Portsmouth, for Bryony's party on Saturday. No drummer for the gig, so we'll be using Burt the electronic drummer. 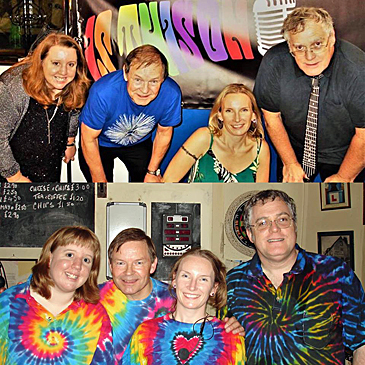 Bryony used to sing with us 12 years ago, and will sing 2 sets with us again on Saturday. It's her birthday, and it's bound to be fun! Two sets with Bryony, one set just Paul, Helen and Terry. It's only rock & roll, but we like it. 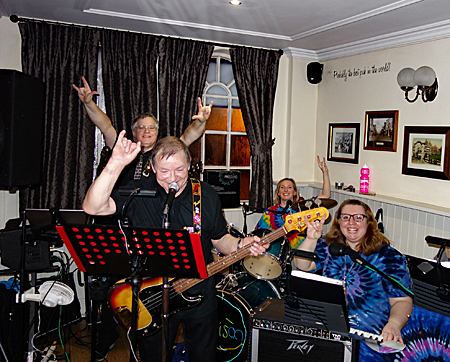 Tuesday 7th January - The New Year's Eve gig at the Artillery was very successful. Lots of singing and dancing, and tills full of currency. Cheers Pete! We'd like to thank all the people that booked us to play in 2013, and all the folks who turned out to listen to us. In the words of Mr Lennon, I got blisters on my fingers! Well, the dust has settled on 2013. Lots of dust. And rain. Lots of rain. Time to fire up the Dyson and advance into 2014 with all amps on 12. This time next year, we'll all be millionaires; in spirit if not in wallet. Wishing everyone a year of contentment. What more could you ask? Sunday 29th December - More gigs at The Old House at Home, and the Alma Arms this month, including a sociable gig with 3/4 of Isthison and UnZipped on Christmas Eve. Jen kindly took a load of photos, some of which are on the photos page. A manic run up to Christmas, with every gig seeming to include unloading and loading in the rain. (The free outdoor shower facility is not always welcome however). The Concert for John was terrific,with music, beer and fantastic catering to fill the day, (as well as our stomachs). Next gig is at the Artillery Arms in Milton on New Year's Eve. We'll be playing from about 9p.m, and into the new year. Come along if you can, we look forward to seeing you dance into 2014! Next gig is at the Old House at Home in Milton on Sunday 15th December - the Concert for John, to celebrate his 60th birthday. We are playing support to Mojo Dollar, so a great day of music in prospect. We start at 2p.m and play until 4p.m or so. Mojo Dollar from 6p.m. Everybody welcome, one not to be missed. Next gig is at the Old House at Home in Milton on Friday 8th November. 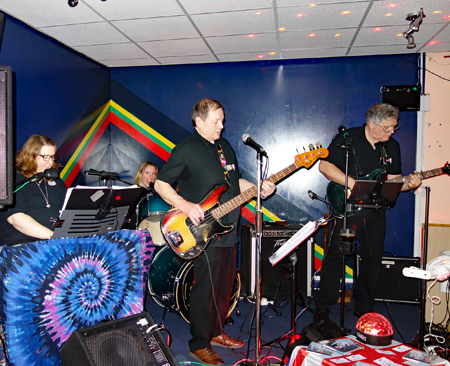 Sunday 20th October - After a long summer break, the band reconvened to play at Dave's party. Two sets became three as the people danced and the balloons burst. Thank goodness we know a lot of songs! As the man said, 'I got blisters on my fingers'. As Helen said 'I got plugs in my ears'. Happy days. Next gig is at the Alma Arms in Eastney on Saturday 26th. Sunday 21st July - Helen has now augmented her family by giving birth to a son James. Wotcha Jim! Congratulations to her and the family. The band are now on maternity leave until October, though there are possible plans for a temporary offshoot to keep the chords flying through the summer.Fingers crossed. So, enjoy the sunshine, and keep on rocking, hope to see you all soon. Sunday 16th June - A very windy gig in Gosport on Saturday; weatherwise that is, not in a 'must cut down on the beans' type scenario. Due to the conditions, we set up indoors, with the P.A speakers outside. A very sociable setting for us, and we had a fun afternoon, with Burt the electronic drummer hammering away. One set with lots of stuff we haven't played for ages, then a break with a cream tea each, followed by set 2, as the strawberries got cheaper and cheaper. We had a reet good laugh, and the music sounded good. Result. All in all, a very pleasant afternoon, and then home for tea. Friday 14th June - Next gig is outdoors at the Newtown Summer Fayre in Gosport. This is Helen's last gig before her maternity leave,so we need to bust it! We are drummerless for this one, (other than Burt the electronic percussionist), and will be playing from 1p.m until around 3p.m. This just might be a cure for the summertime blues! Friday 31st May - Two gigs last weekend, one at the 'Old House at Home' and one at the 'Nell Gwynne'. The new P.A made a good start to life with the band, and sounds good to me. My old Ashdown Peacemaker died; good news for the rhythm section - no guitar, (their dream come true). The P.A was a decent stand in for the guitar amp, and the gig toddled along nicely. Thank you to the Cornish dance troupe and their admirable energy in dancing to everything! Bank holiday Monday at the Nell Gwynne was interesting, with guitar through a hastily resurrected Roland amp. Bad news for the rhythm section - guitar is back. Nice pub, friendly customers. Lots of cider. Yum. Late update - Artillery Arms gig on Sunday is cancelled. We hope to re-schedule this at a later date. Friday 24th May - Our social media fanatics Karen and Helen are running a Facebook page for the band. You can access it via the the blue Facebook button on this page, (above and to the right). Lovely drum and bass pictures for you. Squeezing some oranges at The Nell Gwynne. Ooh er missus. Tuesday 21st May - After attending the re-opening of the Nell Gwynne in Jessie Road, and downing a glass or two of Kingston Black Cider, we've been asked to play a gig there on Bank Holiday Monday. So, lastminute change of weekend plans and we are sorted for 3 sets of music from 6p.m until 9p.m. Beware Ted's Cider Barn. 15 real ciders can result in a loss of fine motor control of the lower limbs. Triffic. 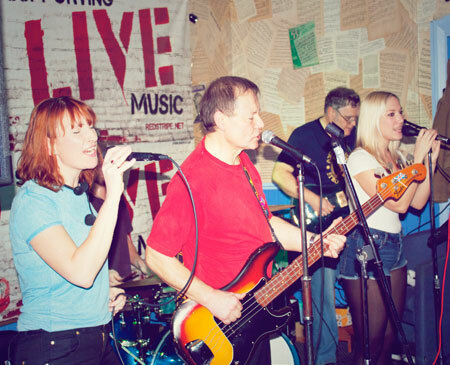 Also, we have a gig at The Old House at Home in Locksway Road on Saturday 25th May, from 9p.m. Please come along to either, or both gigs, we'd love to see you. This will be the baptism of fire for the new P.A system, all ahead, warp factor 11. (That's one more than usual). To P.A or not to P.A, that is the question. a Saturday 4th May - After our last gig, we decided to retire our old Behringer P.A amp. So, cue much discussion plus some financial wheeling and dealing, before settling on a Yamaha EMX 512 . Now to familiarise, (play), with the kit in order to set it up for use in producing that storm of noise we all love so much. Sunday 14th April - A day sandwiched between days of wind and rain. We set up on a somewhat muddy parade ground, with only a partial gale to threaten to blow the tent away. Occasionally, a strange yellow disc appeared in the sky. We set up and started, and the gremlins struck, as our P.A amp started to behave erratically through the first set. We changed this and tweaked that, with limited success. During the Lord Mayor's speech, we re-jigged the whole set up, and things were better for the second set. The weather deteriorated, getting very windy, and then the rain started, so time to pack up, as bits of kit were blown over here and there. A frantic gig at the Old House at Home in support of the Tom Prince Trust. We played two sets, which went down really well with the punters. Matt McGowan did sterling work as the sound man, and played an excellent set in between. We stayed on to watch 'All or Nothing' and the 'Three Belles', who also did excellent sets. Loads of money went into the charity buckets, and much beer was sunk. We have two more bookings at the venue. Our next gig is on Sunday 14th April at Fort Purbrook, at the 9th Annual Classic Vehicle Run, which ends at the fort. We'll be playing two sets on the parade ground, starting at 12.30p.m. The weather forecast is for spring like weather at last, so come along to the fort to see the vehicles, and hear us play. Saturday 26th January - Our 10th Anniversay party was a whole load of work to set up, and like all these things, flew by in a jiffy, (that's a light aircraft in the shape of a lemon squeezer). It was a very busy evening at the Moneyfields Club, with loads of people in attendance. We even had some visitors from the people watching the Elvis impersonator next door. They seemed to like 'Devil Woman' especially. There was a lovely atmosphere throughout the evening, and we ran out of time way before we'd played all the tunes we'd intended. Great to see so many old friends again, as well as some new ones. It was also much appreciated that Bryony and Lucy stepped up to sing with us. Thanks ladies,you were great! We hope to patch together some video to put up on the website, but that may take a little while. We had a fab evening. Some pictures from the party are now on the Photos page, (Pics). Thanks to Sue and Jackie for takng the photos. Monday 31st December - A nice long gig from 9p.m until after 12.30a.m. The Artillery was very busy all evening, and dancers active pretty much the whole time. We zipped through a bunch of new songs, seasoned with old favourites, and this went down very well, in a sweat soaked finale. We all love playing at the Artillery. Now a couple more rehearsals for the party gigs in January. Tally Ho! Saturday 3rd November - Spookie Boogie gig at the Artillery Arms for Halloween. We played a bunch of new songs and Helen christened her new Roland keyboard, a classy piece of kit, which required a change in our band set up. It's always fun to play Ghostbusters' and the Roland provided some new spooky noises. Good gig. So, thumbs up from us for the Roland, and for Paul's new bass strings. Very volumetric. More new songs and arrangements to be completed next, more fun in prospect? Sunday 14th October - Summer's gone, come chill October days! The leaves are falling faster than politicians' promises. We're busy rehearsing a set for Halloween, so out come the songs with ghost, devil, spell or axe murderer in the title. The last one has proved a bit of a problem. So, if you have an axe murderer outfit, or a dracula suit, put it on, and shuffle Zombie style, down to the Artillery Arms in Milton on the 31st, for a crypt rocking early evening. New faster walking Zombies are also welcome. Some of us went to see 'Three Friends' for a bit of Gentle Giant prog rock a couple of weeks ago. Marvellous stuff - 'it sure ain't country' as their lead vocalist said. Never was a truer word spoken. Sunday 15th July - Will the rain ever stop, or should we revive the Ark construction project? Sadly the Waterlooville gig was cancelled, due to performance Licensing problems, but we are requested to play next year. Another week until holidays for all, so the band will close down until nearly the end of August. After that will probably be the 10th Anniversary gig, so we have to book the venue before the holidays. Sunday 3rd June - A terrific day for us. 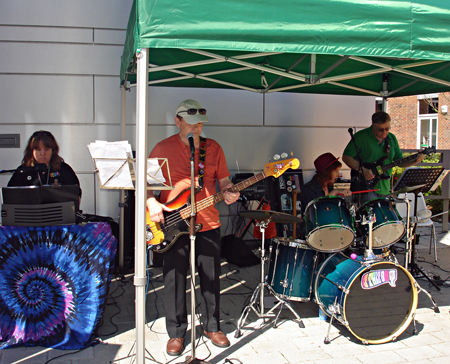 We played two extended gigs in Portsmouth, as part of the Street Party celebrations for Hester Road and Grayshott Road. At Hester Road we played from lunchtime into the afternoon in the garden of the Artillery Arms, with breezy but sunny weather. The audience built through the gig, and we ended playing to a packed garden. We loved the ladies bopping along to Status Quo and Jailhouse Rock, and the sing-a-long choruses. Enjoyable gig. Also loved the tug of war in the street, with the boys anchoring their end of the rope to a bollard, so that they wouldn't lose to the girls. Then on to Grayshott Road. The folks there were very well organised and very friendly as well. They looked after us terrifically well, with pizzas, cakes, cold drinks, and tea in china cups and saucers. We played from teatime into the evening and the residents showed some impressive dance moves. The pole dancers on the scaffold were particularly noteworthy. Another enjoyable gig. All in all, a fabulous day. We met loads of lovely people, and the weather stayed dry. Five hours of playing in one day is a record for us. Rock & Roll! Friday 1st June - As part of our 10th anniversary celebrations, we have had an overhaul/update for our website. Hope you like it! Thanks are due to Jen for the last website, and Sam for the new one. We still hope the future will be fun, fun, fun 'til our daddy takes the T-Bird away. Tuesday 1st May - The Vintage Car Rally gig at Fort Purbrook was fun. Lovely venue in a tent on the parade ground. A freezing north wind made playing a challenge. Even more of a challenge was the Air Ambulance helicopter, which blew away the tent and Helen's keyboards, and also broke one of our P.A speaker stands. How we laughed... Other than that, the Gig went really well. .